1. Design a shock-absorbing system (think springs and cushions). 2. Build spacecraft by attaching shock absorbers to the cardboard platform. 3. Tape the cup to the cardboard platform to hold the astronauts. Cup must be right-side up, with no lid--no cheating! --add soft pads or change shock absorbers so astronauts don't bounce out. The "landers" I saw also had fins or paper wings, which slowed them down as they fell. This must be simulating an Earth landing, as the moon has no atmosphere to slow down a lander, no matter how many wings it has! 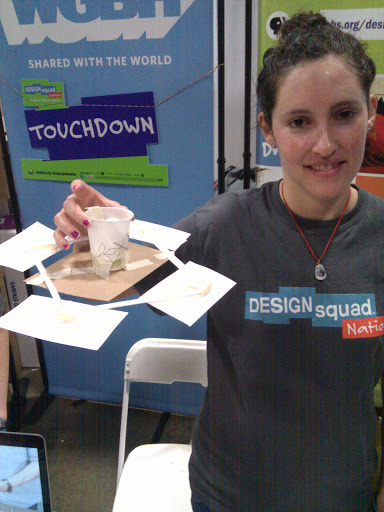 This was the coolest candy experiment I've ever done--or maybe the hottest? Upon realizing (1:30 am last Saturday morning) that the upcoming solar eclipse was a rare annular eclipse that we'd actually be able to see from the southern US, we packed up and started driving south that very day. 26 hours later (we arrived at a Utah mountaintop in time to watch the celestial spectacle as the moon began to cover the sun. To watch the eclipse, we could use a welding face mask, a telescope flipped backwards to project the eclipse onto a white poster, or a pinhole viewer, in which the light goes through a small hole to project the sun's shape. Here's the solar eclipse as seen through the backwards telescope, with the moon covering most of the sun. And here's my pinhole solar eclipse viewer. See that crescent shape in the middle of the shadow? That's the shape of the eclipse. 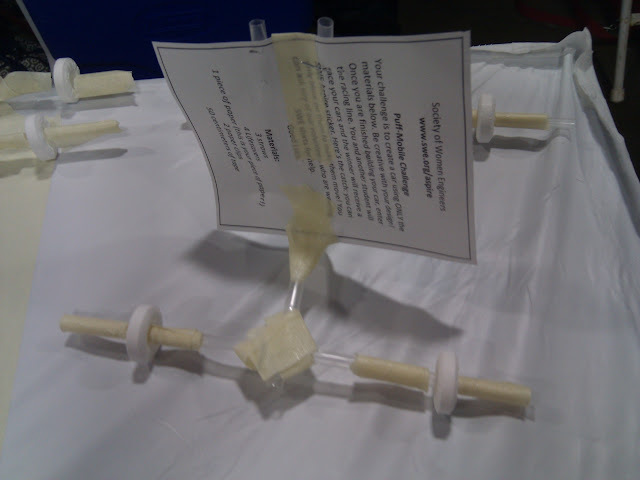 When we were at USASEF, one of the booths down the aisle from us left the floor littered with Lifesavers every night. On the last day I hunted them down, to find out what another group was doing with candy. With their candy wheels and their breath-catching sails, these little cars worked surprisingly well! 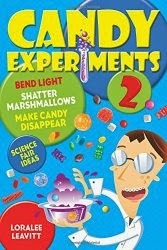 Yet another great way to use candy for science. I'm not a coffee drinker, nor am I on a diet, but I was still intrigued by a recent label for "Fat-Free Half & Half." How can it be fat-free if it's half cream? A look at the ingredient label showed me the two tricks being used. Fat free? I think not. High-calorie? Yes, especially with all that extra sugar. Deceptive? Absolutely. that this candy is more than 1/3 sugar (37%, to be precise). *Though I did realize, on the airplane ride home from DC, that serving sugar cereal for dessert might have some advantages. It's so full of air that kids have to eat several pieces of cereal to get the amount of sugar they'd get from a few pieces of candy. In other words, it takes a little bit longer to eat, and on an airplane ride, that matters! You can also learn more about Dawn's chocolate classes (and cake decorating classes and how to buy specialty ingredients) at her website. --Every time a parent read our blinding orange sign to their kids, so we didn't have to waste our voices repeating the message: "The candy is for experiments, not for eating!" --Watching my family members, as well as a bunch of super volunteers, step up to demonstrate these exciting experiments. This picture gives you only a small idea of just how big the convention center was. We were near the back of the room, nearly halfway down, so there were almost as many booths stretching out on the other side from us as well. 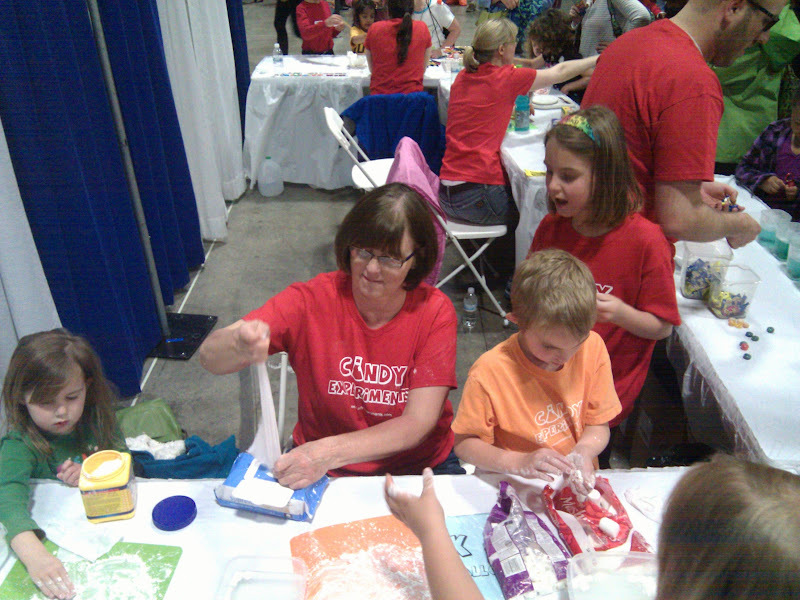 One report said that USASEF attracted so many people, it made the second biggest crowd ever to fill the convention center. I'll believe it--it was very crowded! Everybody joined in the fun--family members, friends, and even my kids. For awhile, my four-year-old was the only person manning the Sink a Marshmallow station. She had the basics exactly right: Squash the marshmallow enough to sink it; if you sink it, you get to try a big marshmallow. I also found some new candy experiments as I was wandering around. Check back for details!